Rabbi Chuck Davidson is on a holy mission to end the Israeli Rabbinate’s monopoly on marriage. Nearly every night of the week, Davidson conducts wedding ceremonies that the rabbinate deems “illegal.” His goal: to get arrested. That’s the only way, he says, to force the courts to rule on what he considers one of the greatest absurdities in the clash between religion and state – where if a couple marries in a Jewish ceremony that’s not registered through the rabbinate, both the couple and the rabbi that married them can face up to a two-year prison sentence. “It simply can’t be that a Jewish act like getting married is criminal in the only Jewish state,” Davidson says. I got to know the renegade Orthodox rabbi while writing about my own daughter’s wedding that bypassed the rabbinate. I wanted to know if she was in any danger of being arrested herself. Davidson says that the current law – which came into effect only two and a half years ago – is really intended to scare off other Orthodox rabbis from going around the rabbinate. The U.S.-born Davidson, who moved to Israel in 1991 and lives today in Beit Shemesh, is anything but quiet. 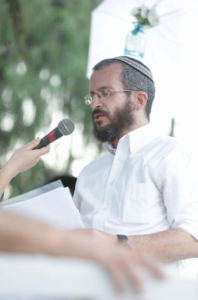 He first broke into the news with the establishment of the Giyur Ke’Halacha alternative conversion court, an idea he says he pushed for five mostly fruitless years until finally Rabbis Shlomo Riskin, David Stav and Nachum Rabinovitch signed on. Giyur Ke’Halacha adopts a friendlier, less rigid approach to conversion that is still compliant with Jewish Law. Weddings were a logical next step. When Davidson officiates at a wedding, he doesn’t charge – after all, how would he give out formal receipts? “It’s kind of hard to open a ‘criminal business,’” he says, only somewhat jokingly. Word is spreading – mainly through word of mouth and the Internet – so much so that Davidson says he now has another rabbi “who’s agreed to join me” to help handle the volume of requests. This already is happening for couples who wish to marry through the rabbinate but whose parents were wed overseas. The court will ask to see your parent’s ketubah (marriage contract) and, if you were married by a non-Orthodox rabbi, you may be asked for more documentation – all the way up to pictures of family members’ tombstones to “prove” you’re Jewish, Davidson says. It can take months. “The whole process is very degrading,” he adds. My daughter could very well have been put in the same position if she’d contacted the rabbinate. My wife and I got hitched in a fully Orthodox ceremony in the U.S. There was nothing egalitarian in it, no women said sheva brachot and the dancing was strictly segregated. By the rabbi who married us, who 40 years ago adopted an Orthodox lifestyle, received his ordination from the Reform movement. Despite avoiding the rabbinate, my daughter is registered with the Interior Ministry as “married” – she and her husband had a civil ceremony in Cyprus beforehand. Many couples don’t go that extra step, opting to live under the category of yeduah b’tzibur – Hebrew for a common law marriage. Davidson is not a big fan. Davidson’s chaos is all about breaking the rabbinate’s monopoly. While Davidson is doing his best – including trying to get arrested – to force the issue, he concedes that ultimately it’s up to the Orthodox establishment to heal itself. Read more about breaking the rabbinate’s monopoly at The Jerusalem Post. Next post: Can religion boost your immune system?